Hey folks. Its le jester over here again. Its been quite sometime since i last make a post on this blog. Today i am going to share about the new archetypes and support that is coming up for bt12 and also share with you all some awesome deck ideas that you can use for the upcoming format. In Bt12 we have a new Badass in the block. 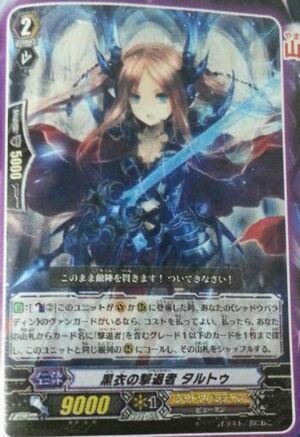 Dote is such a good role model to the other vanguards that bushiroad likes give Revengers A dote to play with. 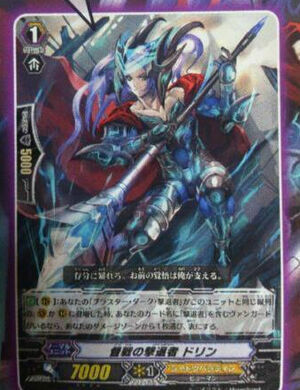 Looks like Shadow paladin have just received a new trump card for the new archetype of "Revengers". So who are the Revengers? A team of resolute warriors who are determined to repel the invaders, chosen among the knights of the clan "Shadow Paladin", which work behind the scenes of United Sanctuary. Despite being frequently assigned to dangerous tasks, they do not gain honor, glory or fame from their work, so there are few members in this team. Nevertheless, since all of them are elites with unparalleled willpower and faith, they have become a disciplined force with high degree of perfection. Its works like a tyranno legend and a dote that rides itself from hand if the cost is paid and gains attack like any break ride. For me i felt that its cost is pretty heavy to pull off and even if you do, at most only once in a match. After using tachikaze for quite sometime, the deck mechanics tend to share a some similarity with each other. They both focused on gaining power while retiring their own units. And at the same time gaining pluses at the same time. Both requires skills and pure timing to pilot and use its effect. His art totally resembles like Origin Mage ildonna. 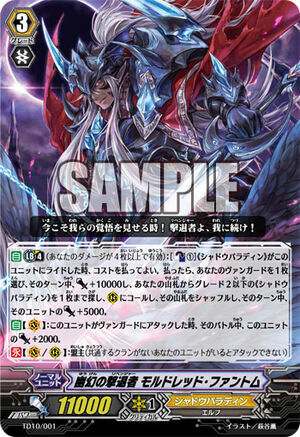 I gotta say his effect is similar to garmore, great silver wolf where ya get to tutor a card directly from the deck, however modred gives an additional 5k power to the rearguard that is being tutored out with just one counterblast. Hmm lets look at some of the few viable options that we have to tutor out a card. We can call a BDR for field control, Tarutu for field swarm and pluses or dorin to unflip damage to spam BDR effect again to control the field. [AUTO]:[Counter Blast (2)] When this unit is placed on (VC) or (RC), if you have a vanguard with "Revenger" in its card name, you may pay the cost. If you do, choose one of your opponent's rear-guards in the front row, and retire it. [AUTO]:[Counter Blast (2)] When this is placed on (VC) or (RC), if you have a «Shadow Paladin» vanguard, you may pay the cost. If you do, search your deck for up to one grade 1 or less card with "Revenger" in its card name, call it to (RC) in the same column as this unit, and shuffle your deck. 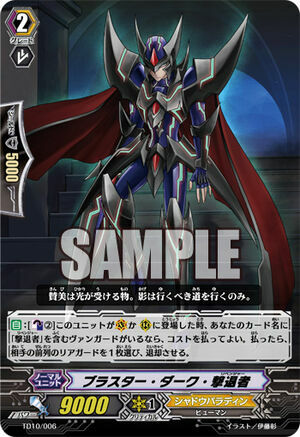 [AUTO](RC):When a card named "Blaster Dark Revenger" is placed on your (VC) or (RC) of the same column as this unit, if you have a vanguard with "Revenger" in its card name, choose a card from your damage zone, and turn it face up. After testing with it for a while, i find that its a deck that is way harder to pilot than tachikaze and granblue. It requires skills to time your big plays properly and to pull of the stunts where it assault at the weak points. However, with the meta swarmed with narukami, Its playstyle is quite slow though at times to keep up and with its field setup gets disrupted its a little hard for them to pull off all the time where its condition are kinda rigid for it to get its pluses. Its not the type of deck where ya can really spam just because you can, in short its more of a combo based deck. As for now i dun wanna reveal more spoilers about the deck yet. 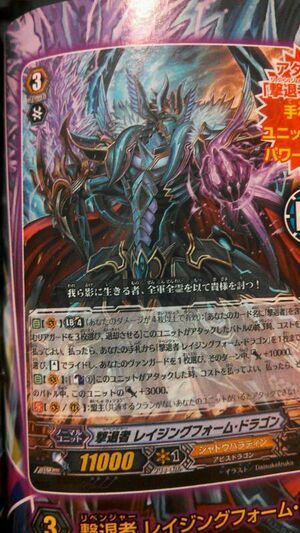 Meanwhile do stay tune to this blog as anytime soon i will be making a review on the new support that dark irregulars have received.